Mantic is working on bringing Hellboy and all his BPRD friends to your tabletop. But games don’t just spring up out of nowhere. There’s a lot of work that goes into their design and development. Mantic is working on pulling back the curtain on this process, by talking with James M. Hewitt, and gets into how the game changed once his skilled hands got to it. James is a very lovely chap and he’s worked with us before on the awesome DreadBall and was our much-loved community manager for about a year. He was also a designer at Games Workshop and worked on big titles like Warhammer Quest: Silver Tower, Blood Bowl 2016 and Necromunda 2017, among others. He’s kind of a big deal (and he’ll let you know this within five seconds of meeting him… if he even lets you look him in the face). From Mantic’s point of view it was extremely exciting to have James on board and he once let us make eye contact in a meeting. However, something that James immediately realised from reading the comics is that there’s a huge amount of investigating involved in the original stories. 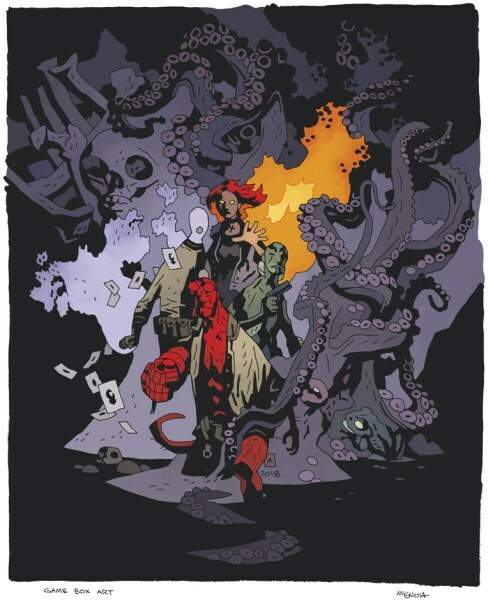 Often Hellboy and the crew won’t know exactly what they’re facing. Instead they must hunt for clues at the scene and, invariably, fight some wicked minions along the way, before facing off against a towering monster (like Sadu-Hem below).